I recently participated in a training by the organization 21/64 (2164.net) to prepare me to be more effective at facilitating conversations across generations about values and philanthropy. One of the exercises we did was about growing goodness in children. I was struck by many of the tips, but one in particular stood out. It was how to make gratitude a habit. Research shows that gratitude leads to greater happiness and can be cultivated through modeling and practice. Thanksgiving provides a moment in time when we can all stop and acknowledge what we are grateful for. In my family it is the one time of year when four generations gather from near and far to be together and celebrate by giving thanks. 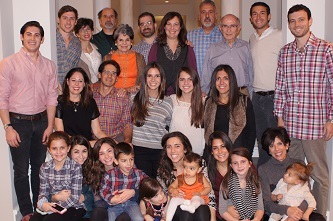 Last Thanksgiving was a typical one for the Perlmutter family. We all gathered at Jay and Lisa’s home with our usual assigned dishes in tow. Our parents transported Mom’s delicious stuffing and turkey, which Dad expertly carved. After capturing a new family photo, we sat down at the table to have our Thanksgiving meal. For as far back as I can remember, our tradition has always been to take a turn reflecting on gratitude and how our year’s experiences have impacted our perspective. During the last few years, this process has taken a while because our family has grown to 27 members. I was sitting next to Dad that night and I saw how intently he listened to each of us as we took our turn. It was easy to see both of our parents’ delight. I will never forget the way they each spoke about their appreciation for each other and their lives during their nearly 63 years of marriage. Dad also expressed his gratitude for having had the opportunity at the recent annual dinner of the Robert E. Loup Jewish Community Center to personally convey his love to the Denver community in which he lived his entire life. Later that night, Dad suffered a severe subdural hematoma and never regained consciousness even after an emergency operation to relieve the pressure. This Thanksgiving is going to be one of those “firsts” for my family. It will be the first Thanksgiving without cherished parents: my father, Jordon Perlmutter, and mother-in-law, Helen Dansky, who passed away just last month. Both parents were incredible role models in how to make gratitude a daily practice and how to find extraordinary meaning in ordinary moments. What better gift than the roadmap to happiness! May your Thanksgiving be filled with meaning and happiness. Vicki Dansky, Senior Gift Planning Officer, at Rose Community Foundation, works with individuals and families to help them determine and meet their current philanthropic goals and plans for the stewardship of their future planned gifts. She is certified as a 21/64 multigenerational philanthropic facilitator. She also supports legal and financial advisors with their clients’ charitable strategies. In addition, Ms. Dansky coaches and leads group trainings on endowment building and planned giving programs for staff and board members to strengthen the capacity of their nonprofit organizations.